Improve Transplanting and Plant Growth. Roses growers use Rhizopon AA Water Soluble Tablet and Hortus IBA Water Soluble Salts rooting solutions when transplanting rooted rose bushes to improve early flower yield. These growers follow the lead of their Dutch counterparts to increase flower yield. > On the left is an un-treated one year rose bush. > On the right is a treated one year rose bush. Traditionally American rose growers allowed one to two years of growth before transplanting rose bushes. Without special treatment a young rose transplant uses its energy to rebuild a root system instead of entire plant growth. Without a strong root system the plant has reduced ability to feed and receive water therefore subject to stress and possible mortality. Dutch growers, for over fifty years, transplant half year old rose bushes. To improve root regeneration and increased first year flower yield when transplanting bare root rose bushes the roots are immersed in a solution containing Rhizopon AA Water Soluble Tablets (or Hortus IBA Water Soluble Salts) dissolved in water. The roots are not cut back except for damaged or broken roots. Living roots contain stored carbohydrates. After treatment the rose bushes are planted immediately. At planting time the soil temperature should be above 60F and air temperature above 65F with relative humidity at 80%. Warm soil temperature is a major factor in utilization of the active ingredients. When transplanting use Rhizopon AA Water Soluble Tablets or Hortus IBA Water Soluble Salts rooting solutions to improve root regeneration and during the growing season to increase root mass and improve overall growth. 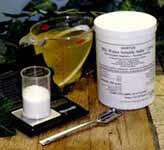 Apply by soil, soak to growing plants solutions help to improve fibrous root mass. The solutions improve transplant success by promoting root regeneration, increasing root mass, produce earlier and higher flower and crop yields and reduce drought stress. Treat bare root transplants by the Immersion-Absorption Method. The bare roots of the plants, in bundles or single, are immersed in a solution with Rhizopon AA Water Soluble Tablets with one to two tablets per liter of water for ten minutes or three to five tablets per liter of water (or 250 ppm IBA as Hortus IBA Water Soluble Salts) for five minutes. Plant as soon as possible. Treat transplants already in the media by soil drench. Hortus IBA Water Soluble Salts at 12-50 ppm IBA. Spray the plugs, balls or bare roots, at the same rates as above, after taking the plants out of a propagation tray. Dip whole plug or ball in solution until fully saturated. After treating roots optionally spray the leaves lightly using the same rates as above. Treat plants in the growing with a Rhizopon AA Water Soluble Tablets or Hortus IBA Water Soluble Salts rooting solution to enhance fibrous root development and increase uptake of water and nutrients. During the growing season for house, tropical, herbaceous, bedding, and flowering plants to improve growth and flowering apply solutions at three to five week intervals and whenever fertilizing. Apply after flower and crop harvesting to improve flower regeneration. Treat plants in plug or ball using spray or dip by saturating the media with a solution. For plants in the ground use a soil drench with a solution and spray the foliage. Use one tenth to one tablet per liter of water. For large growing areas apply by soil drench.